Although India has made improvements over the past decades to both the availability and quality of municipal drinking water systems, its large population has stressed planned water resources and rural areas are left out. In addition, rapid growth in India's urban areas has stretched government solutions, which have been compromised by over-privatization. Water scarcity in India is expected to worsen as the overall population is expected to increase to 1.6 billion by year 2050. To that end, global water scarcity is expected to become a leading cause of national political conflict in the future, and the prognosis for India is no different. With an aim of availability of safe and clean drinking water across India, a Bengaluru based startup Aquapurum, in collaboration with UK's Hydro Industries launched an innovative water treatment technology at an event organized in New Delhi on Monday. Innovative EC technology deployed by the company ensures unbeatable water purification, which has set a new standard for water resources in India. Aquapurum is currently one of the only Indian companies using efficient technological processes for distributed generation of clean and safe drinking water, made accessible to large sections of the population. 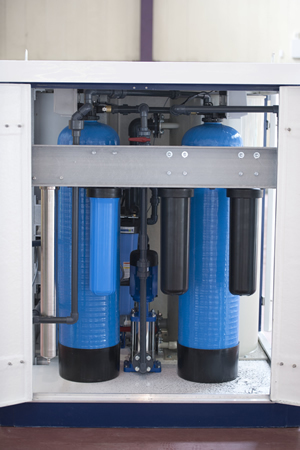 The EC 100 system is connected to the main tank that provides water supply to the entire community. Aquapurum has successfully begun installation of its machine—EC 100—in Rohan Ashima, a residential society in Bengaluru. Some residents have also opted to remove water purifiers from their kitchens, recognizing that the water coming out of their taps is of drinking quality. An innovative 9-step purification process ensures zero wastage of water, enhancing the quality of output and being environmentally sound simultaneously. Supported by 24/7 power access and a throughput of 3000Lt/hr, EC technology has the ability to treat boreholes, river and surface water, converting it into safe drinking water suitable for global usage, as reported by Aquapuram. Based on proven electro-coagulation technology, Aquapurum's innovative product is able to convert borewell or surface water into potable water in a matter of minutes. Several senior officials attended the event from government, estate managers and experts working in the field of water treatment and regeneration. Speaking at the launch event, St. John Gould, India Director, UK Trade and Investment (UKTI) said," We are delighted to bring the best of British technology and innovation to India through this partnership. At UKTI, we are always exploring opportunities for collaboration between UK and India that can benefit both countries. We will be happy if the UK can play a part in India's campaign to get safe water to millions of its citizens," as reported by Deccan Chronicle.